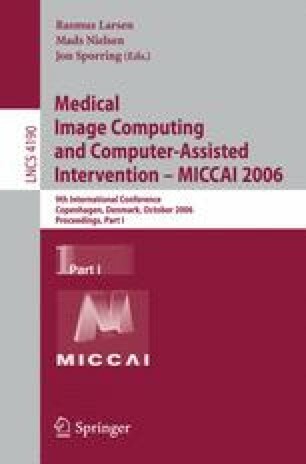 In this article, we present a general statistical parts-based model for representing the appearance of an image set, applied to the problem of inter-subject MR brain image matching. In contrast with global image representations such as active appearance models, the parts-based model consists of a collection of localized image parts whose appearance, geometry and occurrence frequency are quantified statistically. The parts-based approach explicitly addresses the case where one-to-one correspondence does not exist between subjects due to anatomical differences, as parts are not expected to occur in all subjects. The model can be learned automatically, discovering structures that appear with statistical regularity in a large set of subject images, and can be robustly fit to new images, all in the presence of significant inter-subject variability. As parts are derived from generic scale-invariant features, the framework can be applied in a wide variety of image contexts, in order to study the commonality of anatomical parts or to group subjects according to the parts they share. Experimentation shows that a parts-based model can be learned from a large set of MR brain images, and used to determine parts that are common within the group of subjects. Preliminary results indicate that the model can be used to automatically identify distinctive features for inter-subject image registration despite large changes in appearance.